But there is one thing that takes his mind off those horrors: football. “Football is my life. When I play football, I forget about the past because it keeps my mind occupied. I also make new friends,” said Mr. Marchar. Some 172,000 South Sudanese refugees have poured to northern Uganda, according to December 2015 figures from the UN Office for the Coordination of Humanitarian Affairs. Though they have found safety, young refugees are struggling to move forward with their lives. They have few educational or job opportunities, and many lack role models and social support, leaving them vulnerable to exploitation, abuse and disease. 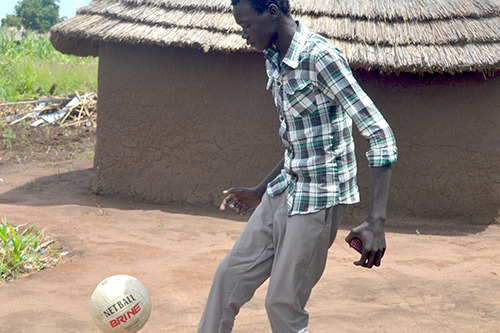 UNFPA is working with partners to offer recreational activities to South Sudanese youth. These efforts – which include sports and drama programmes – not only provide welcome entertainment, but also introduce critical information about their rights and their bodies, helping them make informed decisions about their health and well-being. At two metres tall, refugee Mathew Mach towers over his peers. Like Mr. Marchar, he finds solace in sports, but his game of choice is basketball. “I love basketball. If I am given the opportunity, I could be a good player in future,” he said. But he is already a star in his community – not because he is an athlete but because he is a volunteer. “Such activities do not only keep young people physically and emotionally healthy... It is also through such gatherings that they build substantial relationships, learn from each other about growing up, body changes and making the right healthy choices,” said Aggrey Aikirize of ACCORD, one of UNFPA’s partners. Other UNFPA partners include the American Refugee Council, CARE and the International Rescue Committee. “Many girls are also encouraged to take part in sports activities” to ensure they, too, are reached with this information, said John Thon, the deputy team leader in the Ayilo Refugee Settlement. Rose Dadia, a twenty-something refugee in the Boroli Refugee Settlement in Adjumani, loudly refused to cook dinner for her husband after he staggered home drunk. Their fight escalated until the local council was called. Violence of any form is illegal, a community leader reminded them, advising that they resolve their dispute through mediation. The audience roared with applause. This is how Ms. Dadia and her fellow cast members knew their lessons were well received. “When we are on stage, we see the crowds laughing and clapping, which shows that they are picking and appreciating the messages,” she told UNFPA. Some drama group members are also motivated to volunteer in other capacities. Mr. Thon works with many who reach out to pregnant women with information about antenatal care and other important health services. Their plays and other efforts are having an impact, he said. “We also get a lot of positive comments in appreciation, showing that they have understood the messages."